Safavieh's Courtyard Collection createsa dynamic presence with its fashionable and transitional designs that aresuited for both indoor and outdoor settings. These rugs have been expertlypower loomed of enhanced polypropylene to create intricate motifs and ensure acomfortable surface underfoot. For outdoor use, this rug will turn your deck,poolside, or patio into a resort-style entertaining space. Featuring a mainaccent color of black, this rug is in vogue with its tasteful and bold moderndesign. A nod to the classic checkered picnic tablecloth, this rug has a rusticfeel to it. It elicits a carefree sophistication while elevating any livingspace's decor. It is an indoor / outdoor rug, which I actually prefer, having kids and pets. Color in attached photo pretty accurate. It is a very light creamy taupe and black plaid. Great quality and price. It still shows impressions from being tightly rolled, but I've had several rugs of this sort. The bumps eventually disappear. My teenager said, "Oh, it's so chic!" Super happy with purchase. We placed it in our front room, which is baby-gated off, so the cat can get a break from the big dog, when she wants. Good to know if she coughs up a hairball, cleaning will be no problem. 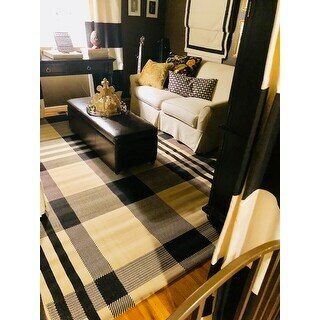 This rug is everything I wanted and more....the off white and black plaid is rich and is the focal point in our family room. 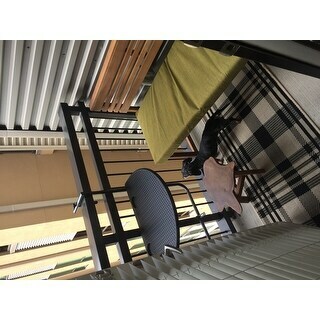 I bought the indoor/outdoor because of the ease in cleaning our frequently used room. Merlot leather recliner, brick-red walls, zebra chair, and burlap linen drapes look sophisticated and yet comfy with this magnificent rug. I looked at other sites but the black/off white plaid wasn't as rich looking,. Quick two day delivery made this purchase perfect..thanks Overstock.com for providing such awesome service. This was my first purchase from Overstock and I couldn't be happier with it. The rug arrived within just a couple days of my ordering it, which was a very pleasant surprise. When I removed it from the package, it did have a slight smell...like vinegar, and I was worried I'd have to return it, but after being aired-out in the room, the smell is gone. I was concerned that it might be a little too small to go under my table and chairs, but it's practically perfect. When all the chairs are pulled-out, all their legs are still on the rug, which is just what I wanted. Overall, I'm very pleased with this first purchase! The rug itself looks great. Appears to be good quality and durable. I like that it can be cleaned easily. I am using it as a runner in my mud room and I think it is perfect for that purpose. The problem is that the size I ordered is advertised as 2 ft. 4 in. x 6 ft. 7 in. However, it is actually 2 ft. 2 in. wide, not 2 ft. 4 in. The correct measurement was also clearly posted on the sticker on the rug, so I do not know why it is being advertised as something else. Two inches makes a difference to me, particular with a runner. In any event, other than the issue with the size, I am very pleased. Love the rug! 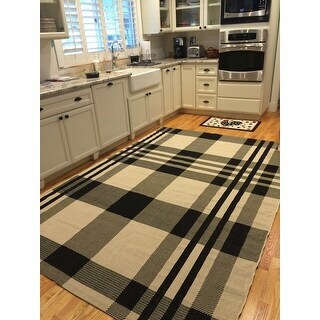 I love indoor/outdoor rugs for under the kitchen and dining tables. I always scotchguard mine but you don’t really need to. They spot clean beautifully and hosing them of a couple of time a year works great. I treat mine because Chicago weather doesn’t always allow me to take it outside to hose off. The added benefit for me is that they are inexpensive. I rotate them outside to the deck every few years and choose a new color/design to change things up. I love the Black and Tan plaid for this fall/winter and also purchased the grey and crime for the summer to lighten things up. They roll up easily and tightly so storing them is easy. I highly recommend...especially if you have a high traffic or very lives in room. Everyone that sees this rug comments on how wonderful it is! I have it in my kitchen and it is large enough to cover most of the floor, accenting the cabinets perfectly! I was very pleased with this rug. 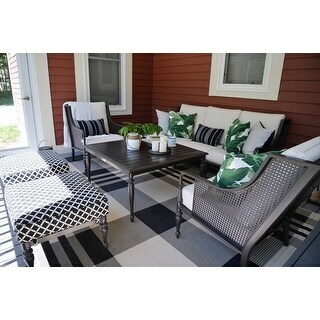 I am using it on my outdoor covered patio, and I love the smart look of the plaid. 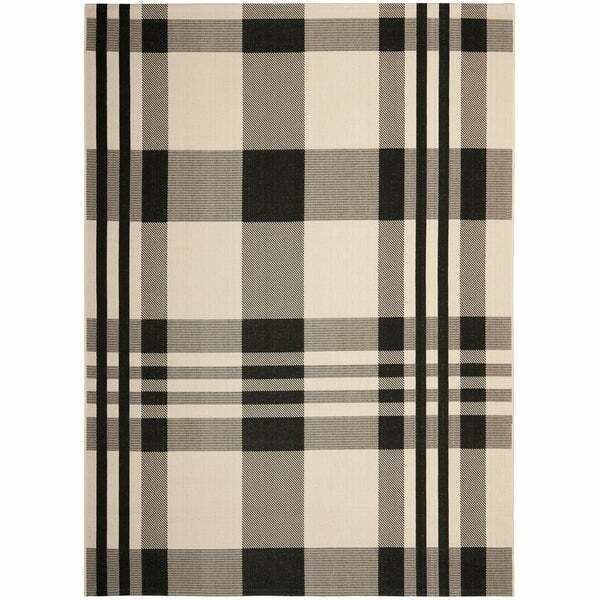 I had looked specifically for this color combination in a plaid rug and found it at Overstock. It is holding up well and I should get several seasons of use out of it. This is a beautiful rug. The colors in the pictures appear Ivory and Black but, in fact are Tan and Black. While I had hoped for the Ivory color, I will still keep it and make it work. Quality of rug is excellent! Price is excellent! I love this rug! However, I wanted to write a review to let people know the color of the rug is tan and black. (On my computer screen, I thought it was white and black). Other than the color being off from what I was expecting-- it's beautiful and I'm going to keep it because I love the pattern! 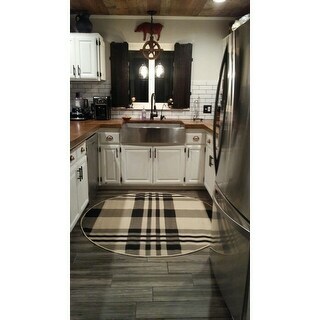 I bought 2 of these rugs for my kitchen. They are super cute, the indoor/outdoor material is proving to hold up well to this messy cook. I would definitely recommend this rug. I've only had mine for about a month but they still look great! Outstanding rug. Modern country style at its best! I could not love this rug more. It was out of stock when I found it but I waited patiently and jumped on it as soon as it came back in stock. It's a nice material, feels weighty, yet soft underfoot. The black and bone colour hide dirt well. It's well constructed, no fraying, and solid seams. It looks very stylish against my more traditional patio furniture. ordered for screened in porch area. dries quick and holds up well with all the rain in NYS. exactly what i had hoped for. have been shopping for similar rugs in person. works perfectly in my kitchen. folds ( came right out, looks great, easy to clean and stays put on the tile floor. I wasn't crazy about this rug when I made my initial purchase but I couldn't resist the sale price, I figured "It'll do." It actually turned out to be the perfect patio rug and Miss Thang (Dachshund in photo) looks great on it! I love it. It fits perfectly with my front porch decor. The rug is just as its pictured. I am very happy with my purchase. Love it! Very well made and color exactly as pictured. I know online purchases can be tricky because of coloring but this one is way off. It's a dark beige color, not as pictured at all. It's a good quality and soft material considering it's indoor/outdoor. I would keep it if the coloring wasn't off. 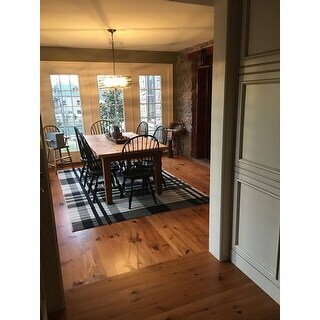 have this rug under our dining room table, very "farm like look" and I love it!!!! Option: 2'3" x 6'7" Runner | 2'7" x 5' | 6'7" x 9'6"
This is a great quality rug that works great for an indoor space. Very happy with this purchase. Nice durable rug. Feels like an indoor / outdoor rug. Took a few days until it laid flat but now it is perfect. I love the plaid look and the neutral color palette goes with so many different decors. 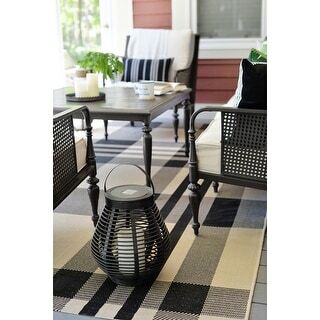 Very nice outdoor rug but is extremely light weight and moves around easily. I will probably have to put a rug pad under it. "I don’t understand the size of this rug and Is it square or round? " Please click options tab to choose from a list of sizes for this rug. "when will the 5x7 safavieh courtyard black white plaid be available??" "When will smaller sizes be available?" This is the smallest size this rug comes in. "Will this rug be available in the larger sizes again? If so do you know when?" We will not be receiving new stock of this item for a minimum of six months. "what are these rugs made of do they have rubber backing or are they nice & heavy to stay put"
I own one of these rugs and it is made of polypropylene. It's an indoor/outdoor fabric that you can hose off and it air dries nicely. It is NOT wool. It is lightweight and does not have a rubber backing. I have used it on a textured concrete porch and had no problems with it shifting. However, on carpeted areas, it slides a lot. "what size is this rug?" 5 x 7. So far, it has been a great rug for our kitchen. "Does this rug fade? I bought this rug in red, and loved it. But rather immediately it faded to a very dim hint of color. It also begin to fall apart. I wonder if the black color would hold up better than the red. I loved the red, but was very disappointed when it faded, and begin to deterioriate so badly." I agree with the I agree with Madonna C. We bought 2 of the black and cream - one for the kitchen and one for our laundry room. They have both held up beautifully and are easy to clean, We haven't had any problems with fading or fraying. I would contact the place you bought them from and discuss it with them.